Sugar is the term by which easily metabolized carbohydrates are known. The various kinds of sugar are known as sucrose or sachharose (household sugar), lactose (milk sugar), fructose (fruit sugar), maltose (malt sugar) and glucose (dextrose). Sugar is an edible crystalline substance that is derived from sugarcane or sugar beet. Sweeteners are additives that are incorporated in foods for adding sweetness. In fact, sweeteners may be natural or artificial and are used as substitutes for sugar. Sugar forms the main ingredient in candies and when consumed in excessive quantities, it may lead to obesity, tooth decay and diabetes. Sweeteners are ingredients that are generally not approved by accreditation boards and states. The European Union approves sweeteners like acesulfame K, cyclamate, aspartame, thaumatin, saccharin and neohesperidine. These are used as table top sweeteners and are generally free of calories. Sugar or its substitutes are not free of side effects, though. Sugar substitutes are also known as polyols. In intense sweeteners, there is practically no calorie content present. Sweeteners are free of calories and sugars have about 2.4 kilo calories of content present. 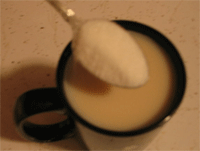 Sweeteners are also often sweeter than sugar or sugar substitutes. Generally, polyols are not as sweet as ordinary sugar; sweeteners are intensely sweetening, sometimes going up to 450 times than that of sugar. Sweeteners are not good for your teeth as they counter the acid forming bacteria inside the mouth which rejects them as nutrients. There are certain classes of ‘friendly’ sweeteners that sweeten your food, at the same time taking care of your dental well being. Sugar also has its potential disadvantages, one of them being its laxative effect which means that it should not be consumed excessively. If you are diagnosed with diabetes, you need to cut down on your sugar intake, although sugar itself does not lead to diabetes. While your doctor may ask you to cut down on sugar, artificial sweeteners may help as they are low in calories. Abishek. "Difference Between Sugar and Sweetener." DifferenceBetween.net. October 19, 2017 < http://www.differencebetween.net/object/difference-between-sugar-and-sweetener/ >. In your first paragraph you state that “sugar…may lead to…diabetes.” In the last you state that “sugar itself does not lead to diabetes.” Can you clarify that for me?